Industry groups pitched EPA a proposal last spring that closely resembled what became Administrator Scott Pruitt's "secret science" plan, according to emails released this week under Freedom of Information Act litigation. 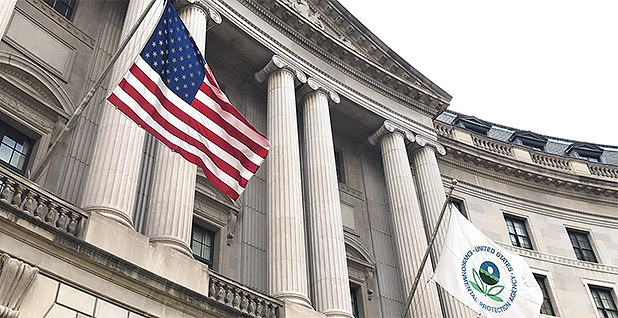 The National Association of Manufacturers offered detailed suggestions on EPA's handling of scientific studies last May to the agency's regulatory reform task force, which was soliciting suggestions on rules and rulemaking. "A common complaint among manufacturers in recent years has been a process at the EPA for evaluating science that is not transparent and minimizes third party stakeholder input," wrote Ross Eisenberg, NAM's vice president of energy and resources policy. "EPA's process often relies on data, information and methods that are not publicly available and are insufficiently transparent to meet the standard of reproducibility. The NAM recommends the EPA take a hard, honest look at how the agency evaluates science and propose reforms to improve transparency and better involve the public." A few days later, Patrick Davis, a senior adviser for public engagement at EPA, commented on NAM's proposal in an email to Samantha Dravis, a top Pruitt aide who was leading the regulatory task force. "I found these comments from NAM all in one place to be very helpful," he wrote. The documents were released to the Southern Environmental Law Centers under FOIA. Davis circulated the suggestions to other colleagues, including Nancy Beck, deputy assistant administrator of EPA's chemicals office. The American Petroleum Institute also pitched EPA on a similar idea last May. Howard Feldman, API's senior director of regulatory and scientific affairs, wrote to the task force, "The science and data used to support a regulation should be reviewed to determine if they are still valid based on scientific integrity, consistent with EPA's Principles of Scientific Integrity and Policy (2012), with meaningful disclosure of all potential areas of bias, guarding against manipulation or misinterpretation." Last July, two members of the EPA task force met with representatives of NAM and API. Prior to the meeting, the task force was provided with NAM materials calling for "reforming [EPA's] process for evaluating science to improve transparency and better involve the public." EPA didn't respond to multiple requests for comment for this story. NAM also didn't respond to multiple inquiries, and an API spokesman redirected inquiries to a May 2017 news release. The emails show that EPA was attentive to industry's desire for re-evaluating science in rulemaking nearly a year before Pruitt formally announced the plan on April 24. "The era of secret science at EPA is coming to an end," Pruitt announced. "The ability to test, authenticate, and reproduce scientific findings is vital for the integrity of rulemaking process. Americans deserve to assess the legitimacy of the science underpinning EPA decisions that may impact their lives." Yogin Kothari of the Union of Concerned Scientists' Center for Science and Democracy said industry promotion of the science plan isn't surprising. "This whole idea is driven by politics, and it's a way to insert politics into science-based policymaking," Kothari said. "If the EPA cared about transparency, they'd be talking to the scientific community, not NAM, who stands to gain if EPA rolled back rules pursuant to this policy." Sean Gallagher, senior government relations officer at the American Association for the Advancement of Science, said EPA never reached out to his organization about the policy. "It's totally fine to consult with industry to get a broad perspective. But they did not reach out to us," Gallagher said. He added, "Our thoughts were out there," noting that his colleagues had written letters warning EPA about "not politically meddling in the scientific process." The newly released emails also show that momentum for the EPA science plan continued to build after a contentious House Science, Space and Technology hearing in February 2017 that committee Republicans dubbed "Making EPA Great Again." The "secret science" proposal has long been championed by House Science Chairman Lamar Smith (R-Texas). Smith, a leading opponent of mainstream climate science, has introduced bills that would require EPA to publicize data it uses when crafting regulations. While Smith used the February 2017 hearing to raise objections to EPA's use of science, he made clear that he had no plans to reintroduce his "Secret Science Reform Act" (E&E Daily, Feb. 8, 2017). NAM had endorsed that bill in a 2014 letter to lawmakers, saying it would "create a more transparent regulatory system that will create better outcomes from the regulatory process." In the wake of Smith's hearing that month, President Trump signed Executive Order 13777, which established regulatory reform task forces at all agencies to identify rules ripe for repeal, replacement or modification. The order set in motion the process by which NAM, API and other groups submitted suggestions to EPA. In response to the order, EPA created a four-member regulatory reform task force, and the panel began soliciting comments from stakeholders on the site Regulations.gov. "Most noteworthy about this docket is that it was record setting!" Barbara Bernales of EPA's Office of Enterprise Information Programs wrote to colleagues. "More individual comments were posted for the Reg Reform docket (63,346) than the [Clean Power Plan] docket — our largest docket ever. In fact, it even surpassed the combined total of individual comments posted (52,973) in response to all dockets that were open for comment during FY 16. I'd say that is pretty amazing." In March 2017, Smith introduced a revised version of his "Secret Science Act" called the "Honest and Open New EPA Science Treatment (HONEST) Act." His office also coordinated with EPA on the unveiling of Pruitt's proposal this year, according to emails obtained by the Union of Concerned Scientists (Climatewire, April 20).